Golden Horn heads the 16 horses that go forward for the £1.15million King George VI & Queen Elizabeth Stakes at Ascot on July 25. 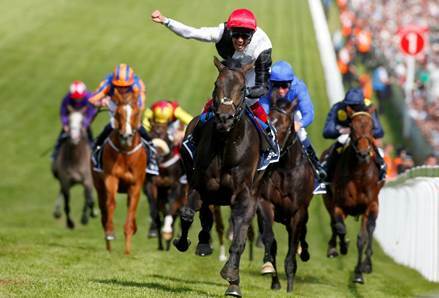 Golden Horn extended his unbeaten record to five wins – that includes victories in the Investec Derby and Betfred Dante – when he landed the Coral-Eclipse at Sandown on July 4 in his first race against older horses. The John Gosden-trained son of Cape Cross is owned by breeder Anthony Oppenheimer, who’s racing manager Hugo Lascelles says the horse is in good order. “Both John Gosden and Mr Oppenheimer have told me that Golden Horn has come out of his win in the Eclipse very well,” Lascelles said. Gosden, successful in the King George VI & Queen Elizabeth Stakes with Taghrooda last year and Nathaniel in 2011, could also be represented by 2014 fourth Eagle Top. Lascelles, who also advises Eagle Top’s owner Lady Bamford, added: “It is the plan for Eagle Top to go again this year for the King George VI & Queen Elizabeth Stakes. Gosden’s other possible remaining entry is 2014 Investec Derby third Romsdal. Last year Gosden’s Taghrooda became only the second Oaks winner to land the King George in the same year as winning the Oaks at Epsom Downs, following the successes of Pawneese in 1976. This year’s Investec Oaks heroine Qualify remains engaged and is one of two fillies representing Ireland’s champion trainer Aidan O’Brien, alongside recent Group 1 Pretty Polly Stakes heroine Diamondsandrubies.